Learning technologies are any software or hardware used by an instructor and/or students in a course. Some of their uses include managing course materials, fostering discussion in and outside of class time, authoring learning materials, sharing media files and assessing learning. Examples include a learning management system (LMS) such as Canvas or a student response system like Top Hat. Canvas: The learning management system (LMS) that campus is transitioning to as the single, centrally supported LMS. The other tools listed all integrate with Canvas to provide a streamlined user experience for instructors and students. AEFIS (Assessment, Evaluation, Feedback & Intervention System): This web-based assessment management solution is used to provide a campus-wide digital course evaluation survey tools, course syllabi and more. In addition to these options, there are other centrally supported and vetted learning technologies available for use. This includes suites of tools like Adobe Creative Cloud, Microsoft Office 365 and Google Apps that are free of charge through licensing agreements and with increased protections of intellectual property. 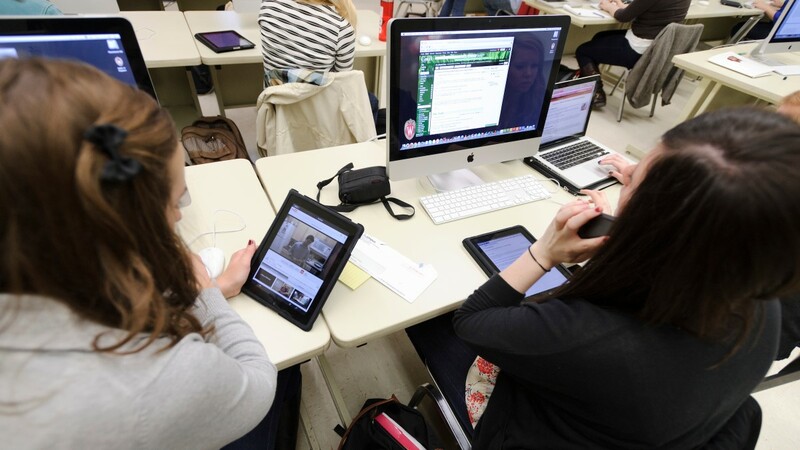 Why should an instructor use a centrally supported or vetted learning technology? The ever-increasing amount and complexity of learning technologies can be challenging for instructors to navigate. An instructor may choose a learning technology that appears adequate, they could be exposing themselves to liability. By using centrally supported or vetted learning technologies helps ensure that content and privacy are protected. In addition, instructors can find support on campus for those technologies. What is the difference between a centrally supported or vetted learning technology? Instructors who use centrally supported learning technologies receive technical and pedagogical help for free from DoIT. For example, Canvas is centrally supported, which means DoIT Academic Technology offers instructors technical and pedagogical help such as how to use the peer review feature to engage students in small group work. In addition, both instructors and students can get basic technical support from the DoIT Help Desk. Vetted technologies refer to those that campus has investigated and confirmed to be compliant with the Family Educational Rights and Privacy Act (FERPA) and other data privacy best practices and policies. Unlike centrally supported technologies, DoIT AT only offers limited pedagogical support and no technical support for instructors and students who use them. Instead, this support may be provided by the product vendor. For example, Pearson My Labs is vetted; instructors and students can use it, but any technical or pedagogical questions must go to the vendor. How does a technology become centrally supported? Centrally supported learning technologies have been deemed central to the teaching and learning mission of the University of Wisconsin-Madison. All centrally supported learning technologies go through a rigorous vetting and approval process although the exact process does vary. For most of them, the University has conducted a search and evaluated them against competing technologies on criteria such as accessibility, cost, data privacy, FERPA compliance, ease of use, student cognitive load and whether they complement the University’s teaching and learning mission. For example, Kaltura MediaSpace became available for campus use through a UW System search and screen process that resulted in a contract with the vendor. Another example is the decision to transition to Canvas as the single, centrally supported LMS on our campus, which was based on positive results from pilot studies and campus feedback especially from students not wanting to learn multiple LMS platforms. All of our centrally supported learning technologies have gone through similar adoption processes and are subject to input and approval from campus governance groups such as the Faculty Senate and the Teaching and Learning Technology Advisory Group. What are some things to be aware of when using centrally supported and vetted tools? While using approved teaching technologies limits or prevents legal liabilities, there are still some things to be aware of when using any learning technology. First, not all tools are free for students. For example, Top Hat is free for instructors to use, but requires students to buy a subscription. Tools that require students to purchase something should only be used thoughtfully and fully incorporated into your course. For that reason, Top Hat should not be used solely to take attendance. Second, many vendors of centrally supported tools offer support services to instructors, including helping to create content. If you allow a vendor to help you create content, particularly if it is on their platform, you may lose your intellectual property rights to that content. Additionally, content created on a third party vendor’s platform may not be easily downloadable or transferrable. What is the process for requesting a learning technology be vetted or centrally supported? Learning technologies are constantly being introduced and expanded. In addition, colleagues, vendors and articles share innovative ways to incorporate current and emerging technology into curriculum. The Learn@UW team is available to consult with instructors about vetting new technologies, recommending alternative technologies already centrally supported and liaising with vendors that contact instructors directly. The team is available through email at learnuwsupport@doit.wisc.edu. In addition, the Learn@UW team has a form you can fill out to request having an external learning technology be vetted and integrated with Canvas. To request features in Canvas, instructors can fill out this form and a campus instructional technologist will follow up with them about possible solutions or raising the issue with the vendor. In the development of our Student Digital Ecosystem (SDE), UW-Madison is often offered or encouraged to use additional, related tools or add-ons, such as student response systems, publisher tools and sister products like Canvas Catalog and Bridge. Oftentimes, vendors approach faculty and instructional staff directly. As it’s time consuming and difficult to navigate the evaluation of these suggested tools, we encourage people to forward vendor requests to the Learn@UW-Madison team at learnuwsupport@doit.wisc.edu. The team will then review the tools to ensure they adhere to UW-Madison purchasing, legal, FERPA and student data ownership requirements.